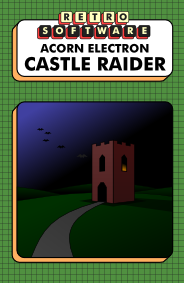 Castle Raider is a sideways scrolling platform game for the Acorn Electron and BBC Micro in the style of Castle Quest, using techniques like those employed by the Electron version of Moon Raider. As the sun dips below the ramparts of the old town, the last of the troops file in. As they make their way through the narrow, cobbled streets, small groups of them quietly slink away into the many taverns that give this district its bad reputation. The lamps are lit and the merriment spills out onto the streets with laughing, singing, pushing and shoving. There will be trouble later, but by then you will be long gone. It is time for the guard to change, time for the night watch to begin their duties, but they are in no hurry; though the outlaws in the countryside know the force stationed here will be no threat tonight, they gave them a wide berth during their march here. The people in the nearby villages can sleep soundly for a change. As the members of the night watch slowly begin to take their places on the ramparts you take your chance and slip through the open gate, taking refuge in the long shadows fleeing the sunset. The few eyes looking in your direction are hardly able to make out your form as you wait for the approaching nightfall. You recall the stories told when you were young. When the town itself was already old, the last of the elders told of a time when it was still a village, not much more than a few houses and shelters. The road that ran through it went to the castle on the edge of the wasteland that now lies derelict and deserted. Night falls quickly in this season at the edge of the kingdom. Memories of fireside tales about the king's lost crown and the hidden treasure of the old kingdom make the journey across the plains more bearable. Soon you arrive at the outer fortifications. Crossing a bridge, you enter. As you pass beneath the outer gate it suddenly crashes into place, cutting off your exit. It was just as well you hadn't planned to return that way. Nature has reclaimed parts of the castle, its ruins crumbling in places and crawling with creatures that people once knew well to leave alone. To make your way through it to the lands beyond, you will need to unlock the few doors and gates that still stand. Perhaps the folk tales were true and the king's treasure still remains, but survival is more important here. If you live to pass through the outer gate then the story alone will have made the journey worthwhile. Added a ROM cartridge version for the Electron. Added a ROM image for the BBC Micro. Added informational chunks to the UEF files. The disk images are unchanged. Updated the UEF files so they can be converted to WAV files that load successfully on real hardware. 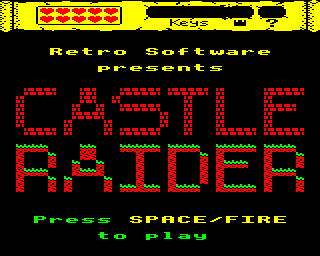 The in-game title screen. The game itself. Exploring the basement. In the dungeon. 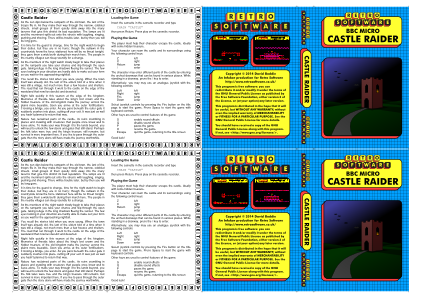 Cassette inlays for both the Acorn Electron and BBC Model B versions of the game have been created. Click the images below to download zipped PDF files for printing on A4 paper. Or you can download a zip archive of the latest post-release code here. The code is built using a Python script. You will need the Ophis assembler to assemble the code - this is done automatically by the build script. The output of the build script is a UEF file which can be used in Elkulator, BeebEm, B-Em and ElectrEm. Playthrough videos of the game, showing one particular solution, can be found at the Internet Archive and on YouTube.